Fantasies fulfilled – ‘Rebel’ Launches at Shakespeare Festival | AUTHOR. ACTOR. SWORDSMAN. This was more fun than any author deserves! 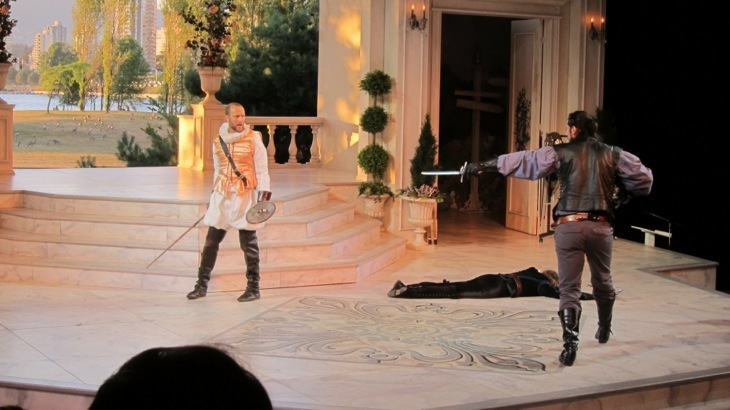 To be on stage at a premier Shakespeare festival, in a packed tent… wearing pantaloons! Given license to rave about Hamlet, to read from my new novel, to leap around with a sword, duel with some of Canada’s top swordsmen… and win! Here’s the first photo of many I’ll post in next few days. Click on it to enlarge! John Lawley takes on the vast Spaniard! This entry was posted in Uncategorized and tagged acting, book launch, historical fiction, novels, publishing news, shakespeare, writers. Bookmark the permalink. Thanks for sharing it, Brandy. I had a total blast. Wow! Thanks, Patricia. Great to see you there!